Home > Preview > So, did I like the Doom beta? So, did I like the Doom beta? I was going to leave it at that, because my disappointment in the marketing demo (sorry, beta) was crushing and complete, however expected it was. But in the interest of being a little more insightful, here's a video of me playing the game quite poorly, and a couple of reasons why I was so disappointed with it. More than anything else what disappointed me about Doom is how overwhelmingly competent it is. For most games you might consider that "competent" is perfectly reasonable, but in the context of Doom I do mean it in a pejorative sense. The demo/ beta/ whatever-Bethesda-wants-to-call-it-to-pretent-that-it's-not-a-marketing-gimmick-to-drive-up-preorders features two levels of multiplayer, and both of them show that very careful consideration that has gone into balance and design. They're designed to prevent choke points, to keep the action moving, and to allow some teamwork for the more serious players to get into. But lordy lord lord, that's not what Doom should be about. That's not what I should be noticing when I'm playing a game with "Doom" on the front splash screen. 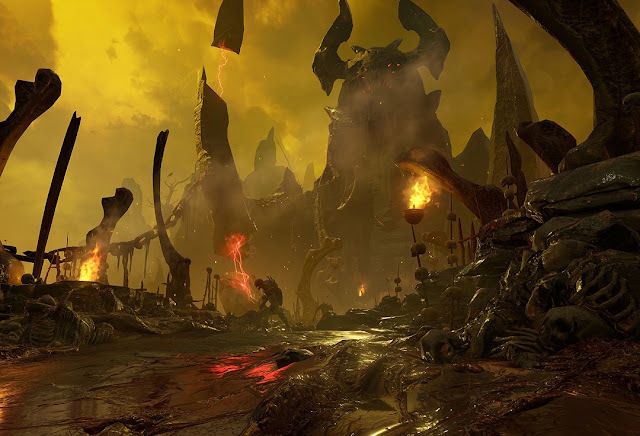 One of the two levels was set in the "hell" environment, themed as we can expect from the single player game, and it reveals every weakness about Doom that I actually care about. Guys, some dirty brown rock suspended over a chasm with a pentagram carved into the surface and a big skull thing watching over the action is only "hell" in the most unimaginative of minds. And don't get me started on how generic the environments were for the marine's space facility (the other multiplayer level environment). Here's the thing about Doom: the original Doom was such a striking game because, at the time, it was overwhelming in its vision. This here was a hugely transgressive, angry, violent, brutally powerful, downright metal game back in its day. It was unmitigated creativity in the hands of a small development team that simply wanted to push boundaries, and it was aggressively pure in its vision. It just happened that that vision turned into commercial success, but that is almost a side note to the raw creativity and vision that drove the development of the game. But this Doom is the polar opposite in design and development ideology; this one is a carefully constructed blockbuster. Yeah, it's got gore. It's got a lot of gore. But gore is already so explicit and normalised in gaming that it's hardly transgressive to see pools of crimson littering around a battlefield. We're told we're going to hell, but what we're really seeing is the most superficial hell that we've ever seen in a game - it ticks of all the boxes for a sadistic nightmare realm without ever actually throwing itself into that place. For all the power that modern game engines give game developers to really run away with creativity, Doom displays a complete lack of it. The mechanics feel much the same. I liked that heath doesn't auto-regenerate in this game. It's a nice throwback to classic shooters, and at the same time it keeps players moving in order to keep their health up. And the action is fast and arcade heavy - I've no qualms with how Doom plays. But then there are so many mechanically solid shooters out there by now, we don't actually need yet another. 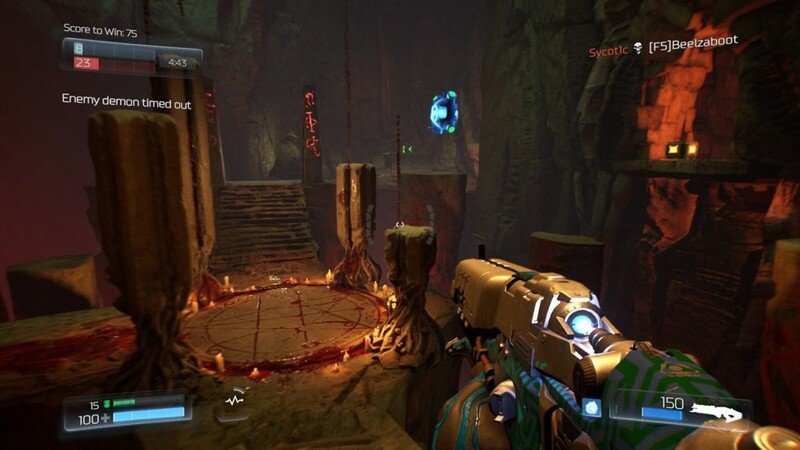 And yet there is Doom, being yet another mechanically solid shooter. Unless the single player game is literally an entirely different game, I've got no faith in Doom (hah, pun!). From this beta I see no evidence whatsoever that the development team has the slightest clue why the original Doom was such an important game, let alone the creative strength and will to understand how to recapture that magic itself. It's possible to do - the recent remake of Shadow Warrior actually did everything that the original Shadow Warrior did - potentially offensive humour and all - but for a new generation. Shadow Warrior had the right idea - when we're talking about transgressive games, success requires a development team to throw themselves out there and really take some creative risks. It needs to be prepared to offend (and thus lose sales) in order to achieve the extreme experience that the heritage of transgression mandates. This here Doom feels like a game made by committee against a checklist to achieve commercial success. And hey, it may well be a commercial success. But I really could not care if it was. I like my games creative and interesting, and on that basis I already have next to no patience for Doom.